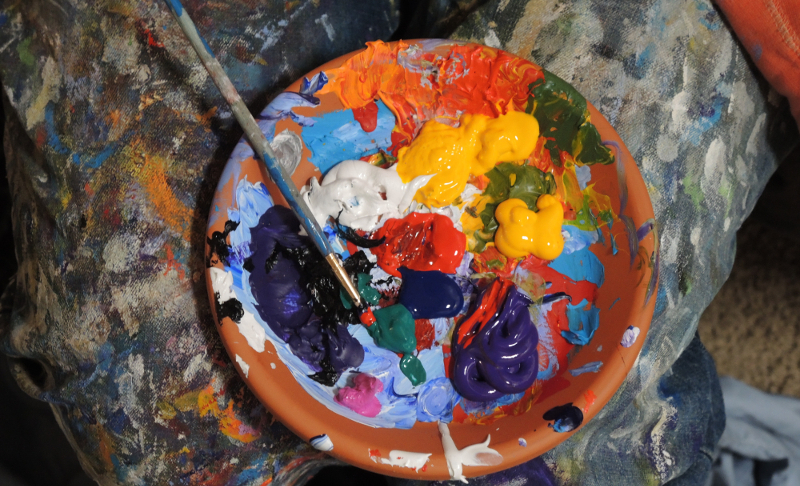 There are many reasons why you would want to start painting. You've watched Bob Ross create mighty mountains and emerald lakes with just a few strokes of his brush and want to follow in his foot steps. You're looking for a new hobby that is not only cheap, but incredibly fun and great for your mental health. A bonding experience for you and your significant other or your kids. Maybe you're all about business and looking for a new side hustle and a new and easy way to earn money. Or you've finally decided to take things into your own hands and paint the painting you're dreaming of for years. Just like with painting, the possibilities are endless. But no matter your motivation - one question remains. Can it really be as easy as Bob Ross makes it seem? "I used to watch Bob Ross paint on TV as a child and started painting when I rediscovered him years later. I didn't expect much from my first painting but I was blown away just how good it came out! My friends and family now call me Bob Ross Reborn and have asked me for paintings for their living rooms!" Follow the four steps of this guide and find out why nobody ever regrets buying supplies and painting along with Bob. You and your friends and family won't believe your eyes when you'll see the masterpieces you'll create. If you have never done this style of painting before we suggest you watch the 'Joy of Painting' special 'The Grandeur of Summer' even before buying your equipment. It's one hour long and Bob introduces you to all the equipment and also shows you how to prepare a blank canvas with Liquid White before starting to paint. With almost twice as long as a normal episode this one is a fantastic starting point because really goes into details on all the different techniques and explains them very well to beginners. After you have watched 'The Grandeur of Summer' it is time to get your equipment. For a beginner we strongly recommend getting the official Bob Ross Master Paint Set . It is a carefully selected painting kit that contains the tools and colors you need to start painting right away without having to worry about buying brushes made from the right material or oil paints with the right oil-to-pigment ratio. You can find a detailed review of the Master Paint Set here. Now all you need to start painting is a little bit of paint thinner and some canvases. You can also head over to our Tools & Colors section and look for alternatives to the licensed Bob Ross products. There are several other painting kits offered by the Bob Ross Company. You can find a small overview here. To help you save some real money when getting your supplies we've created a dealfinder that gives you all the best offers and deals for Bob Ross painting supplies on Amazon.com. Get the Bob Ross Master Set now! Once you have all your equipment you're ready to put on some old clothes, take a few hours of time and watch 'The Grandeur of Summer' once more, painting along with Bob, pausing and rewinding as needed. Once your done we would be very happy if you would send us your master piece on Twitter. Didn't get the snow on the mountains to break like Bob does? Insted of putting highlights on trees you're just mixing mud? You're not the only beginner who has problems with these things, so Bob did a few Q&A episodes where he tries to answer questions from viewers and goes into more detail describing these techniques. You can also find some tips on how to improve your paintings on our blog. Here at TwoInchBrush we have a great community of painters sharing their works, tips and tricks with each other. You can see the paintings they have uploaded here. We would love for you to join us and show your paintings to the world. Simply create an account and upload your paintings!